One-on-one application help from Jeannie Burlowski makes an ideal graduation, birthday, or holiday gift. Med school applicants feel relieved and happy to have a professional person available to help them with the application process, especially with the very difficult and critically important personal essays. 6) All things you would do for your applicant if only you could! And the best thing? My help is unobtrusive. Your applicant still runs the show, doing all the parts of the application he or she can easily do himself or herself. The applicant you care about only asks Jeannie for help on the parts that feel tricky. And because of Jeannie’s thoroughly fair “by the hour” payment structure, you only pay for the help that your particular applicant wants or needs. Most people who decide to purchase this service as a gift make a phone appointment with me, and we tailor-make the gift during that one phone call. Sometimes we decide that a paper gift certificate will be best; sometimes we dream up a more fun, creative way to present this gift to the applicant. 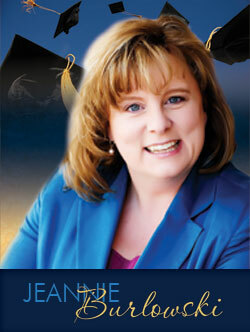 You can get a free phone call with me now by emailing jeannie@getintomedschool.com. To learn more about the help I offer, visit my GET HELP NOW page. If you’d like a little more info about me, read on. I’m a full time private academic strategist, consultant, and speaker. I have an extraordinary record of getting students into highly competitive law, medical, business, and grad school programs even when college and university advisors said that they “didn’t have a chance.” My work has been featured in publications such as The Huffington Post, USA Today, NerdWallet, and US News and World Report. You can learn more about my story at JeannieBurlowski.com/ABOUT. You can follow me on Twitter @JBurlowski.